That is not what Willard had in mind. Even if some would claim all things are settled so stop thinking too much, loving God with our minds still requires good thinking. We are helped by noticing logical fallacies as we evaluate arguments. From time to time I have invited my friend Greg to write up a short piece highlighting a specific fallacy. Here is his piece on false equivalence. We might as well start with Hitler, since we’ll get there anyway, and this week, it’s perfectly legitimate to reference Nazis. Jesus and Hitler both started important movements, so they are the same. That’s an egregious example of false equivalence, an informal logical fallacy that relies on a similarity between two things. The similarity is then taken to encompass the whole of the comparison, making the two things equivalent in the mind or the argument of the one offering the comparison. It’s easy to see why the example offered breaks down. Jesus did start a movement, and it was predicated on love and forgiveness. Hitler also started a movement, and you know that’s where the similarities end; to say that they are the same is a clear example of false equivalence. 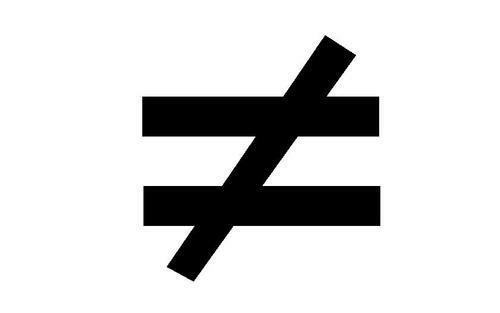 They are not logically equal. Analogy: A is like B.
Equivalence: A is the same as B in important ways. The former is far more common than the latter. Take your typical 14-year old as an example. This is what we would charitably call a weak analogy. The mother is like Hitler only inasmuch as she is preventing the teenager from doing something the teenager wants to do. As analogs go, that’s incredibly weak. If the mother was killing the teens friends in horrific experiments, the analog is much stronger. False equivalence typically deals with things happening in the real world, so it’s not usually an abstraction. It’s possible to do it as a thought exercise, but we typically only refer to it to discuss real world things or events. This week provides the perfect example. The counter-protestors in Charlottesville are just as bad as the Unite the Right protestors because they came armed and looking for violence. Black Lives Matter and Antifa are the same as the alt-Right protestors. Both sides use violence to achieve their ends. They are both equally bad (wrong, etc.). First a caveat. Identifying a false equivalence requires a desire to do so. That may seem trite, but it cannot be emphasized enough. We now live in a world where facts are subject to politicization, which is to say, a fact is only a fact if it works for me or my side. Anything that works against me or my side is not a fact. This is a clear example of confirmation bias, a tendency that afflicts all humans irrespective of their political affiliation. What is required is a desire to get at the truth, whatever the truth may be, even—especially—if it conflicts with what I believe. That is supposed to be a hallmark of the Christian tradition, but it seems to be dying a slow death these days. Are the counter-protestors in Charlottesville the same as the Nazis in Charlottesville? If relying on the comparison that both are willing to use violence, then the claim is barely true, and then only if incredibly important information is ignored. Do the counter-protestors want to set up a government that enslaves other races? Do they want to deport white people “back to their own country?” Do they want to systematically remove the rights of white people? No. No. No. Do the Nazis? Yeah. We are talking about actual Nazis here. Secondly, were the counter-protestors all Leftists activists or “antifa,” as they have come to be known? Only if clergy from various denominations and faiths with linked arms are Leftist activists. Methodists, Episcopalians, Baptists, Reform Jews, Sunni Muslims, etc., all Leftist activists? No. Were all the protestors on the Right some version of a white supremacist? As far as we know, yes. They were chanting “Death to Jews,” and “blood and soil,” a rallying cry for white supremacists that dates back to the Third Reich. Whether or not we want to quibble with the methods of the “Left” in this situation, we must first set aside questions of methodology and discuss questions of identity. Were we dealing with actual Nazis? Yes. Is anyone in America today that you can think of as bad as actual Nazis? I hope the answer is no, and if it is, then the two sides are not equivalent.